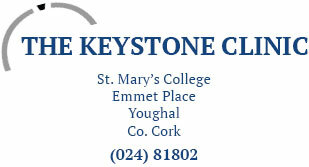 Counselling & Psychotherapy at the Keystone Clinic is a confidential service provided to members of the community regardless of race, religion, ethnicity, sexual orientation, educational background and financial means. We work in accordance with the Irish Association for Counselling & Psychotherapy’s Code of Ethics and offer a safe and effective counselling service. Counselling can help you identify your problems and assist you in finding the best ways to cope with your thoughts, feelings, beliefs and behaviours. This may involve changing behaviours that contribute to the problem or by finding constructive ways to deal with a situation that is beyond your personal control. We work as integrative practitioners by incorporating various therapeutic approaches to facilitate the individual needs of clients. This allows us to work from an evidence-based perspective as different orientations lend themselves to best resolve certain difficulties. Cognitive behavioral therapy, for example, is often considered best practice in the treatment of anxiety and depression; however, individual needs may also suggest the use of either psychodynamic or humanistic approaches. We have specialised training in trauma treatment and incorporate this into their psychotherapeutic practice when necessary. Marianne is trained in Eye Movement Desensitisation and Reprocessing (EMDR), an evidence-based approach in the treatment of PTSD and other lesser traumas. This approach is particularly effective for clients who feel that past traumas remain stuck in their memory and refuse to shift.